Those of you who read Blog daily know that I gave Twisty Stitches Volume One: Amadeus through Jessica a rave review. And now Carole and Michael have followed up with a second volume on string art stitches covering the Mistake Stitch to the Walento. Go buy this book. It’s like nothing else available. The only people who don’t need this book are those who only do basketweave. Everyone else, whether you do a lot of counted canvaswork or specialize in painted canvases, can benefit from Michael’s and Carole’s help. After all, everyone needs to do these 3-D type stitches occasionally and some of us use them all the time. Since they aren’t done in just a step or two, they can be difficult to understand and when you go wrong, it’s hard to figure out why. Twisty Two, just like the first volume, makes how they are constructed easy to understand and helps you see how to create variations on the basic stitch. String art stitches without pain? The ghost of Jean Hilton (the designer who made string art stitches needlepoint) approves this book! Now for the fine print. Just like volume one, this is a spiral-bound book with heavy plastic covers. 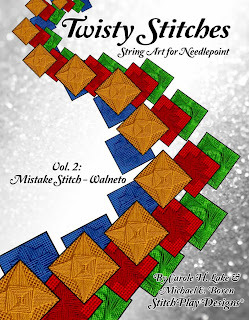 Twisty Two is 52 pages long (including the cover page, a one page bibliography, and a color page showing off the various stitches) and covers seven stitches: Mistake Stitch, Plaited Rays, Rhodes Stitch, Sheaf Stitch, Sprats Head, Waffle Stitch and Walento. Why is a book about seven stitches so long, you ask? Because each stitch is diagrammed step-by-step with a little color thumbnail photo for each step. They even include a photo of what the reverse side of a stitch looks like. 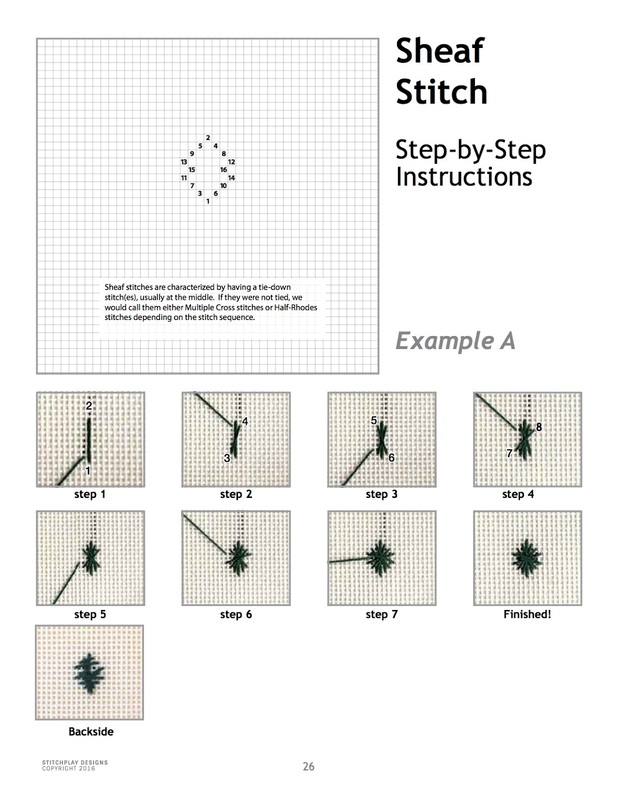 There’s a general introduction with tips that apply to all these type stitches but each stitch section has tips to help you with that stitch in particular. Plus Carole and Michael diagram stitch variations for each of the Main Seven Stitches. 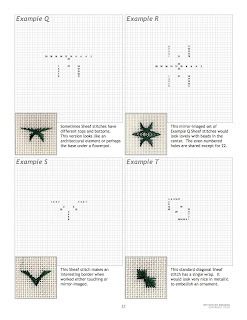 I choose Sheaf Stitch at random to show you how the diagramming of the main stitch looks. (Click on the thumbnail for a better view.) The actual examples are stitched with red, green, blue or pink threads, which means folks with a vision problem can probably still see them ok. 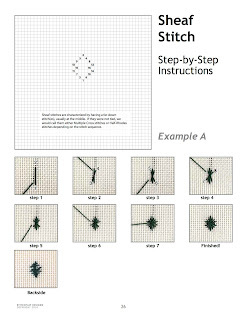 The variations for each of the seven stitches have their own little diagram and a color photo to show how they look stitched. 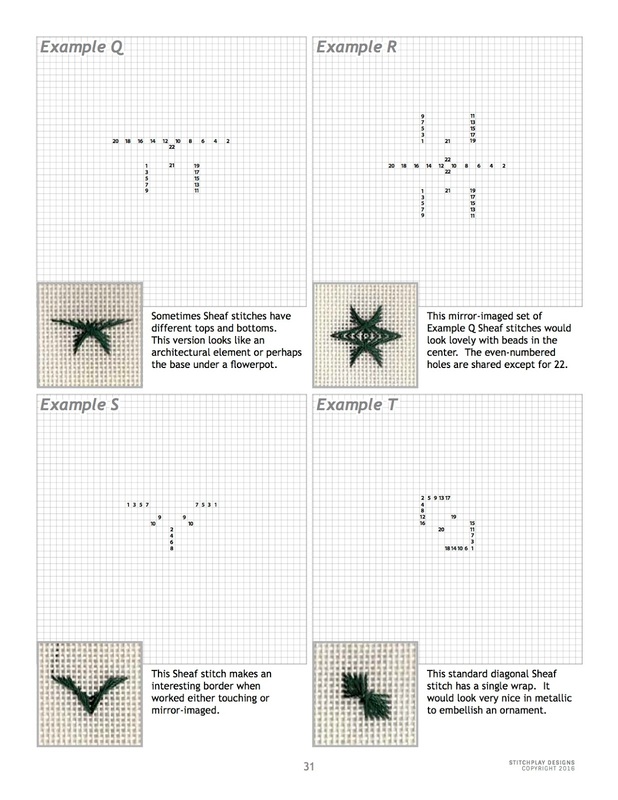 There are twenty variations of Sheaf Stitch, each with a little diagram and photo, for example. Four of the variations are shown above. Both volumes are Must Haves for the serious needlepointer, even if you only use them as reference material a few times a year. If they are a little pricey for you, see if your local shop or guild chapter will buy both volumes for everyone to share, or go in with a group of stitching friends. Trust me, you are going to be glad you have access to these great books! Now, how do I stitch an Airy Rhodes again…?